Industries throughout America are beginning to grow and expand as the economy continues to recover from the recent recession. One area in particular, the transportation and shipping industry, is experiencing exponential growth, with consumer spending hitting new highs. As consumers spend more money, more goods need to be shipped from manufacturer to retailer to help keep up with the growing demand. With transportation companies expanding diesel truck fleets to keep up with this need, businesses in Virginia are actively seeking certified diesel mechanics to maintain and service these vehicles. Individuals who are looking to enter this fast-paced industry should enroll in a diesel mechanic school in Virginia to increase their job opportunities and chances of success in the mechanic industry. Most community colleges and vocational institutes offer diesel technology certification programs for potential students who meet the required educational prerequisites. While the prerequisites may vary from school to school, all colleges require applicants to have earned their high school diploma or GED prior to enrollment. Some state universities hold higher prerequisite standards, requiring future students to have taken a minimum of two years of high school math and science as well as four years of English. Although some businesses will work with candidates who have several years of experience and no formal education, the majority of Virginia companies prefer hiring candidates who have earned a degree in diesel technology. Due to the increased demand for certified diesel mechanics, a few companies offer to sponsor certification programs for applicants who have not completed any formal training. 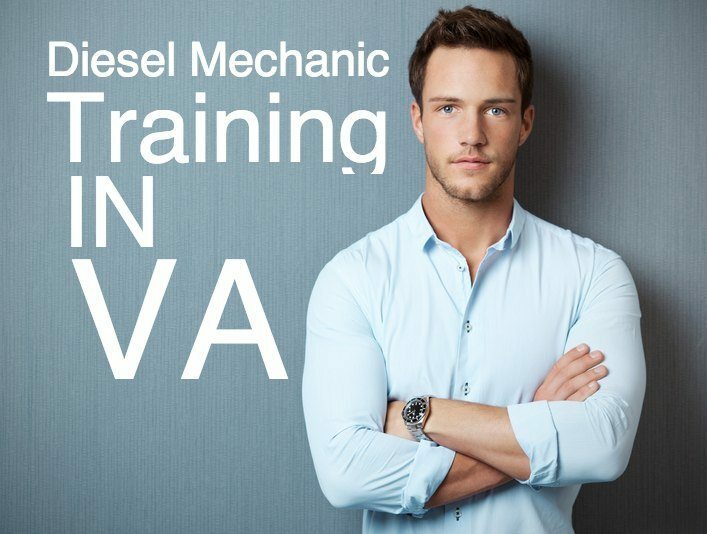 Individuals who wish to start a career as diesel mechanics should earn a degree in diesel technology to increase their chances of being hired by an upstanding company in Virginia. During the school-hunting process, individuals should check the accreditation of any potential colleges, making sure that the diesel mechanic program is accredited through the National Automotive Technicians Education Foundation (NATEF). The NATEF will prepare students for further certification down the road. Students who wish to attend an accredited college can choose between an associate and bachelor’s degree in diesel technology. Students hoping to hold a management position or own a diesel garage at some point in their career will often decide to earn a Bachelor of Science in Diesel Technology. Taking the average student four to five years to complete, this degree digs deeper into the science and technology behind diesel engines. Although Virginia does not require diesel mechanics to be certified in order to legally work at companies in this state, individuals who wish to become diesel mechanics should earn their certification, especially since most Virginia companies only hire applicants who have taken the initiative to become certified in this field. Most employers like to see potential diesel mechanics pursue a certificate through the National Institute for Automotive Service Excellence (ASE) after gaining a few years of work experience, demonstrating the mechanic’s proficiency in the areas of brakes, electrical systems, steering systems, and preventative maintenance. Diesel mechanics can even earn their Master Diesel Mechanic license through the ASE to increase their pay grade and advancement opportunities. According to studies conducted by the U.S. Bureau of Labor Statistics (BLS), approximately 6,590 diesel mechanics work in Virginia’s mechanic industry, allowing them to earn an average salary of $42,400 per year. Economists at the BLS report a favorable employment outlook for the diesel mechanic industry, predicting the faster-than-average growth rate over the next few years will add approximately 21,600 positions nationwide. Local Government: With certain metropolitan areas around Virginia set to experience strong population growth over the next several years, the need for diesel mechanics to service the public transportation vehicles and heavy equipment will grow as well. Transportation and Shipping Companies: As retailers and manufacturers rush to keep up with consumer demand, diesel fleets will put on more miles and deal with more wear and tear on a regular basis. Diesel mechanics will be needed to keep the vehicles in top working condition. Local Garages: Diesel repair shops will have to hire additional diesel mechanics to keep up with the expected increase in diesel-powered cars. The need for certified diesel mechanics is expected to grow at exponential rates over the next decade. As shipping companies in Virginia log more miles on diesel-powered vehicles, diesel mechanics will find various employment opportunities for keeping these vehicles running efficiently. Individuals interested in changing careers and becoming diesel mechanics should earn a degree in diesel technology to increase their chances of success in this industry.